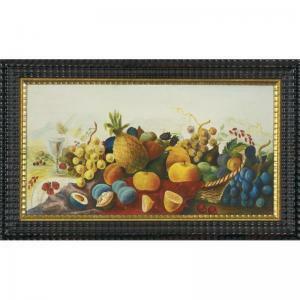 Find artworks, auction results, sale prices and pictures of Joseph H. Hidley at auctions worldwide. * Attributed to Joseph Hidley (American, 1830-1872) Winter Scene oil on canvas 22 1/2 x 30 3/4 inches. Joseph H. Hidley - Farm Scene. Unsigned. 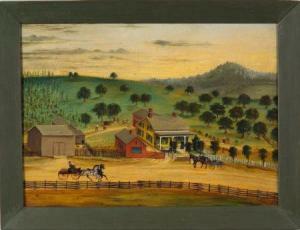 Oil on panel, c. 1860, depicting adetailed bird's-eye view of a rural Rensselaer County, New Yorkfarmstead with a house and outbuildings, figures, animals, andhorse drawn carriages against a hilly tree-lined background, 12 3/8x 17 1/8 in., in a later green-painted wooden frame. Condition:Minor surface abrasion u.c. Between the Rivers: Itinerant Painters from theConnecticut to the Hudson River Valley. April 7-July 22, 1990;Museum of Fine Arts, Springfield, Massachusetts, Sept. 9-November4, 1990; The Hudson River Museum, January 20-March 10, 1991,retaining exhibition label. Note: Joseph H. Hidley was an itinerant artist, likely self-taught,who eked out a meager livelihood working a variety of jobs tosupport his wife and family, in addition to his painting. He wasborn in 1830, in Greenbush, New York, and of four siblings, was theonly surviving child when his father died just before his fourthbirthday. He lived with relatives and his mother until he marriedCaroline Danforth in 1853 and settled in Poestenkill, New York.They had six children, but only three survived infancy. Along withtownscapes and landscapes, he did religious paintings, taxidermyarrangements, fireboards, decorative under window panels, and a fewportraits. He died of consumption in 1872 at the age of 42. Hisworks are included in several museums and collections including theAbby Aldridge Rockefeller Folk Art Museum, the Metropolitan Museumof Art, the Museum of Fine Arts in Boston, the New York HistoricalSociety, the New York State Historical Association/Fenimore ArtMuseum, and the Rensselaer County Historical Society.